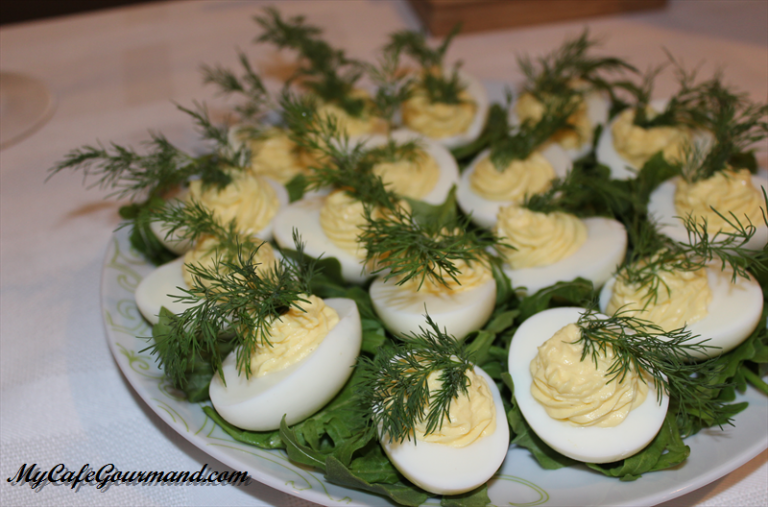 Deviled eggs are the perfect healthy appetizers and always welcome at a party. This is very easy recipe with softened butter and a bit of garlic. To cook a perfect boiled eggs, simply place eggs in a large saucepan. Cover them with cool water by 1 inch. Cover pan with a lid and bring to a boil over high heat, boil for 6 to 7 minutes over medium heat for perfect hard boiled eggs. Carefully peel the eggs and slice them in half lengthwise. Remove yollk and transfer it to a medium bowl. Mash the yolk with a fork until crumbly. Add the mayonnaise, butter,garlic, salt and pepper and combine until incorporated. Place the mixture in a piping bag fitted with a medium tip (or teaspoon), pipe the yollk mixture into the whites.